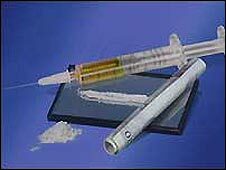 Drugs testing by students at the University of Bristol has suggested cocaine is used at most of its bars. Journalists for the college newspaper, Epigram, used swabs to reveal traces of the drug at six of the seven hall bars they tested. But news features editor Georgia Graham said it did not necessarily indicate widespread drug use. "It could be one person on a serious bar crawl, this is by no means everyone at university doing drugs," she said. "This could be a small amount of people deciding to do drugs in inappropriate places." Swabs were used to wipe down cisterns and other flat surfaces in toilets of all Stoke Bishop hall bars, a newspaper spokesperson said. Traces of the Class A drug were found at Wills Hall, University Hall, Badock Hall, Churchill Hall and Hiatt Baker Hall, with only Durdham Hall showing no traces. Tests were not carried out at the Clifton halls. Swabs were ordered from a specialist internet drug testing company and contain a chemical called cobalt thiocyanate which turns blue if traces of cocaine are found. Jerry Woods, the university security services manager, said: "Based on our figures - despite us trying to be proactive - we have very small numbers of recorded drug offences across the university and certainly no real evidence of cocaine use." "We deal robustly with anyone who is found to be in possession of or taking drugs at university and we will seize them and report them onto (the university police officer) who invariably issues an £80 fixed penalty notice."